You want to go to VMworld 2015 US or Europe, but your company/boss does not want to pay for the conference pass? Then try your luck and win your pass to the show in one of the many sweepstakes. 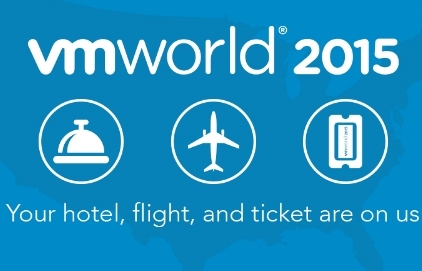 In this post I try to put together a list with possibilities where and how you can win tickets for VMworld 2015 US and Europe. If one is missing – leave a comment or write me a DM via Twitter @lessi001. Coho Data is giving away 5 FULL conference passes to VMworld San Francisco. One lucky winner will be selected each day of the week from August 3rd – 7th. This is really a great VMworld Ticket sweepstake: Simplivity is giving away three tickets to VMworld 2015 in San Francisco. But giving away the tickets is not all! Each winner will receive Airfare and hotel accommodations, too!!! So register here for your chance! Winners will be announced July 17, July 24 and July 31! Great opportunity from Veeam: answer all trivia questions correctly to win a VMworld Full Conference Pass & a Veeam Party Fast Pass. 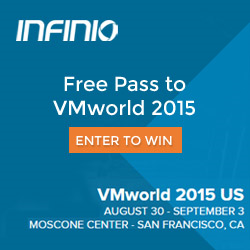 Infinio gives away a full conference pass for VMworld 2015 US. Follow the link and complete the form – the winner will be announced on Friday, July 17th. VMTurbo raffles full conference passes – there are three drawings: May 29, June 19 and July 10. Register here to win! The three best scores (minimum time to complete the lab) will receive a 2015 full conference pass to their choice of VMworld San Francisco or VMworld Barcelona! Interested? Join the Business Moblility Summit and win a VMworld pass from CloudCredibility.com.